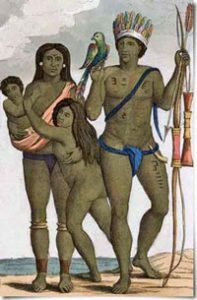 The Arawak probably first arrived in South America with the second wave of people, around 15,000 BC. They were probably fishing people with canoes or boats, travelling south along the Atlantic coastline following the fish. The Arawak settled first in what is now Venezuela, along the Orinoco River, eating a lot of fish, shellfish, and wild yuca root. That’s where they were about 8000 BC when they started farming yuca root. They learned from their neighbors to farm corn and beans, peanuts, sweet potatoes, peppers, cocoa, and pineapples as well as yuca root. The Arawak grew tobacco for their religious rituals. By around 1000 BC, they were also growing cotton and spinning and weaving it into clothing. It was hot enough where the Arawak lived that people didn’t wear much clothing, but they loved swimming. Once the Arawak started farming, they wanted to control more land, so they conquered land both south and north along the Atlantic coast. They lived along the banks of the Amazon river. 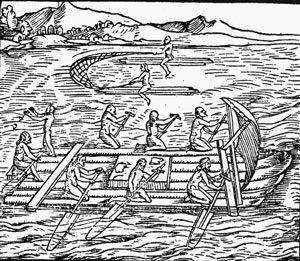 Around 300 BC, maybe as a response to Maya expansion, they also used their boats to take over the Caribbean islands. The Arawak brought all of their farming crops to the islands, too. Like other South American people – the Valdivia people in Ecuador, the Maya people in Guatamala, or the Tupi people in Brazil – Arawak artists carved small abstract figures of people and animals in stone. Nobody knows what they used these figures for. But probably these were part of their religious ceremonies, like similar carvings from Old Kingdom Egypt or Shang Dynasty China or Stone Age Japan. About 1200 AD, a related group of people paddled over from Venezuela and started to conquer the Arawak. These people were the Caribs. By the 1400s AD, the Caribs had succeeded in conquering some of the islands, while the Arawak were still living on other islands. Then Christopher Columbus arrived. Did you find out what you wanted to know about Arawak history? Let us know in the comments. What happened to the Arawak after Columbus arrived? Cite this page: Carr, K.E. Who are the Arawak? – South American history. Quatr.us Study Guides, September 8, 2017. Web. April 20, 2019.